Alan S. Bandy and Benjamin L. Merkle, Understanding Prophecy: A Biblical-Theological Approach (Grand Rapids: Kregel, 2015). Alan Bandy is assistant professor of New Testament at Oklahoma Baptist University, and Benjamin Merkle is professor of New Testament and Greek at Southeaster Baptist Theological Seminary. The former is a historical premillennialist and the latter an amillennialist (p. 9). Understanding Prophecy consists of ten chapters, a conclusion, and two appendices. 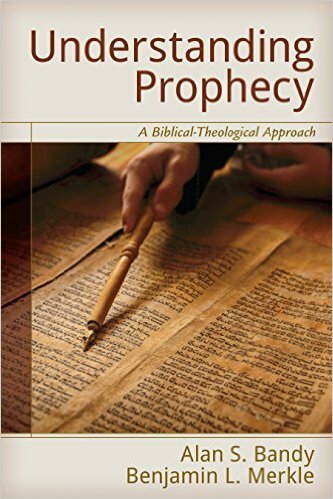 The first three chapters are introductory in nature and address the keys to understanding prophecy, defining prophecy, and most importantly for the authors’ perspective is the role of biblical theology in understanding prophecy or as the subtitle of the book states, a biblical-theological approach. The next three chapters, 4-6, examine Old Testament prophecies which are placed into three categories: unconditional, conditional, and fulfilled prophecy. Chapters 7–10 addresses New Testament prophecies under two major categories: prophecies related to the first coming of Messiah and the return of the Messiah (this category is further sub-divided into prophecies in the Gospels and Acts, the Epistles, and Revelation). Finally there is a brief five-page conclusion and two appendices on (1) the meaning of “all Israel” in Rom 11:26 and (2) the meaning of the millennium. Overall, there is much to commend this book. It is clear and fairly thorough in content. The goal of the book is clearly stated, namely, “to give readers a framework of how to interpret any passage in the context of the Bible” (p. 9). Its tone is irenic and its treatment of differing positions generally fair. (Although this reviewer differs in a number of ways from the authors’ positions, I did not sense that my views were treated inequitably or uncharitably.) One can also appreciate the theologically conservative stance taken towards the inspiration of prophecy in particular (“it is divine revelation, p. 17) and Scripture in general (p. 64). My main issue with the book is that although I could affirm much of the first three chapters that deal with prolegomena, I am unconvinced that the authors’ general approach is the best way to make sense of prophecy, especially of the Old Testament. To see most of the Old Testament prophetic corpus as either being fulfilled historically before the First Advent (e.g., see the treatment of Isa 13 and Ezek 32, p. 99-101) or in the First Advent (see esp. chp. 5) seems to flatten or neuter the language of the texts. I remain unconvinced, at least with the examples at hand, that the distinction between literal and literalistically works. While the latter might be accused of over-specificity, the former might be guilty of oversimplifying the language of the text. It seems possible that one might play the literalistic card as a way of avoiding the details of a prophetic oracle that one might find embarrassing or inconsistent with one’s theological position. The authors’ treatment of Ezekiel’s temple might illustrate this (pp. 121–22). I was surprised that there was not more distinction made over the millennial issue. I wonder what kingdom, if not the kingdom prophesied in the Old Testament, the historical premillennialist Bandy has in mind. This reviewer also differed with a number of the authors’ interpretations of New Testament prophecies, most notably in Revelation, but it is the Old Testament treatment that is most problematic. This work could also enhance its usefulness by including a bibliography and at least a Scripture index and perhaps an author index. Ultimately, Understanding Prophecy lays out a way of understanding prophecy but probably not the best way of understanding prophecy. Thanks to Kregel for providing the free copy used in this review. Should One Pursue Ph.D. Studies?